The CDMA Intercept is a cellular monitoring system that captures voice and data from CDMA mobile phone subscribers. Not only does it capture conversations, but it is an SMS Intercept as well, for it can intercept SMS messages, dialed phone numbers, and other data. CDMA interception is for Law Enforcement users only, and this system stores all intercepted communications internally. All cellular monitoring of the CDMA Intercept is saved on its internal hard drive. The system can store hundreds of thousands of hours of voice recordings on 3 hard drives that are 2 Terabytes each, which can be accessed by the user for future review. It is a cellular monitoring system that is passive, leaving no active impressions on the CDMA cellular network, leaving no indications that cellular interception has taken place. With a compact briefcase and built in console, the supplied laptop rests above the inboard radio telemetry, making the intercept portable. 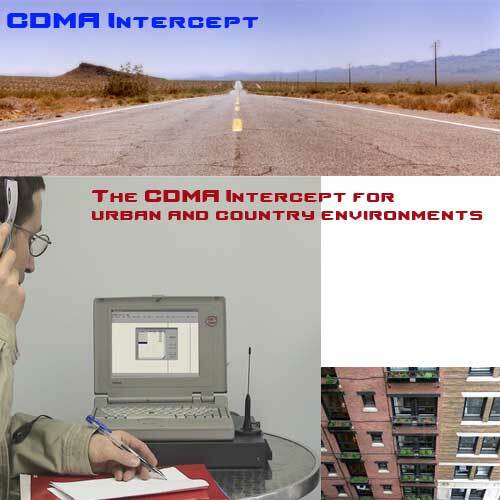 Using a proprietary technique, the CDMA Intercept system can capture both reverse and forward channels of a CDMA network connection between the targeted cellular subscriber and the local wireless access point. The system offers straightforward sorting features to recall recorded segments, be they voice or data. The CDMA cellular intercept monitors control and voice channels with the strongest signal level in the area of operation. The system can either portray the 'entry points' of the CDMA network subscribers in that area, and then prompts the user to choose which one to focus on. The system can also ignore masses of subscribers it encounters, and focus on a specific target. This would involve targeting the electronic telephone number and / or ESN to monitor both sides of the conversation as well as the data exchanged. Because the SMS Intercept function translates the data it captures, it can receive and decode SMS messages in the local language where system is in use.